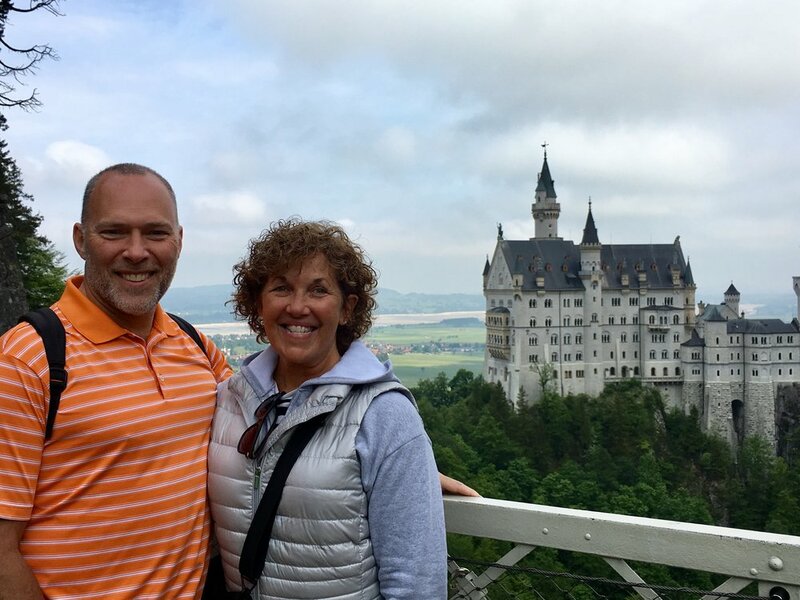 So, even though we had arrived in Austria last night, we went back into Germany this morning to visit mad King Ludwig's very famous castle - Neuschwanstein. But before we left, I snapped the photo below of one of the evergreen trees in the field across the road. 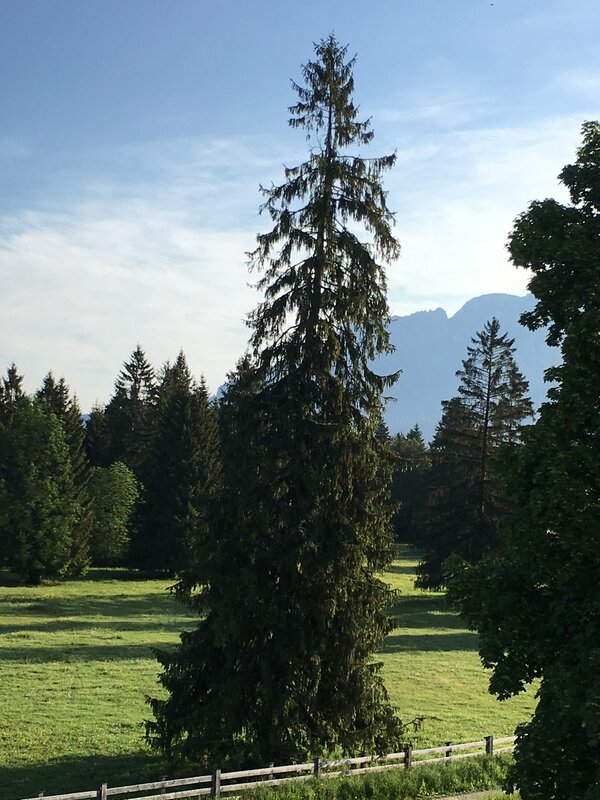 I just love the look of these tall slender trees, a species of Spruce I think. They don't have a large drip-line, but are very tall and I think very pretty. It's been nice to see large groups of this type of tree as we see them while riding on the bus. 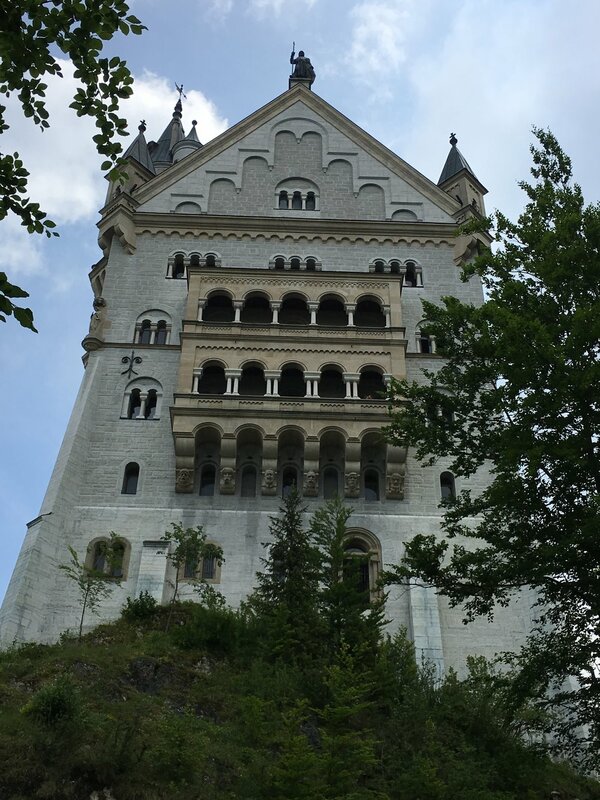 There is another castle very near to Neuschwanstein, it is called Hohenshwangau Castle, and it is the castle that Ludwig's family lived in before he built the newer Neuschwanstein. Before we reached the castle, we were able to go out on a high bridge over a beautiful waterfall between the two castles If you look in the photo below, the eleventh and twelfth persons from the right side are Dean and Janice. The two photos after this one show the view below the bridge, the first one up hill away from Neuschwanstein, the next down the hill closer to the castle. Oh, and I was just kidding about us being in the image immediately below. I took the picture from the castle. Ha ha! The foundation was laid in late 1869 and at his death in 1886, Mad Ludwig's castle was not complete. 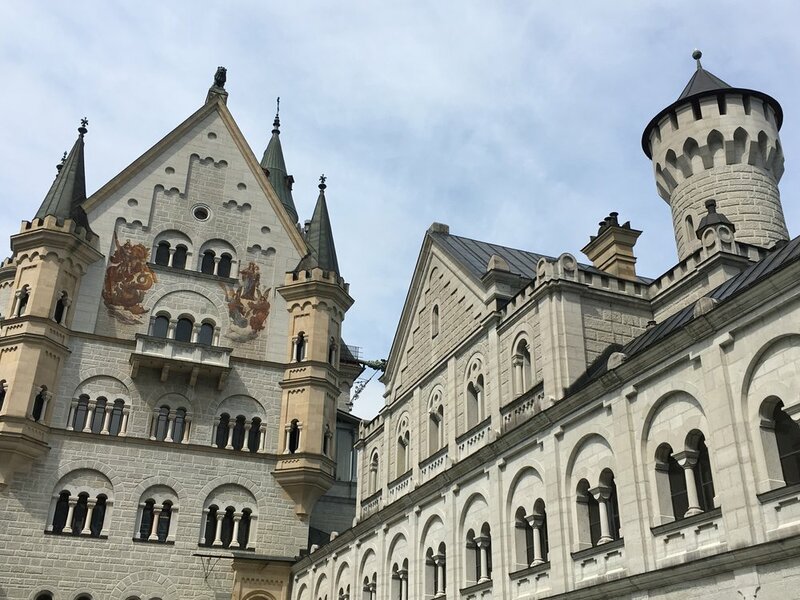 We were able to go into the castle for a 35 minute tour through the areas which had been completed by Ludwig. It is as impressive inside as outside, but photography inside was not allowed. So please enjoy the next few images below from various viewpoints outside. 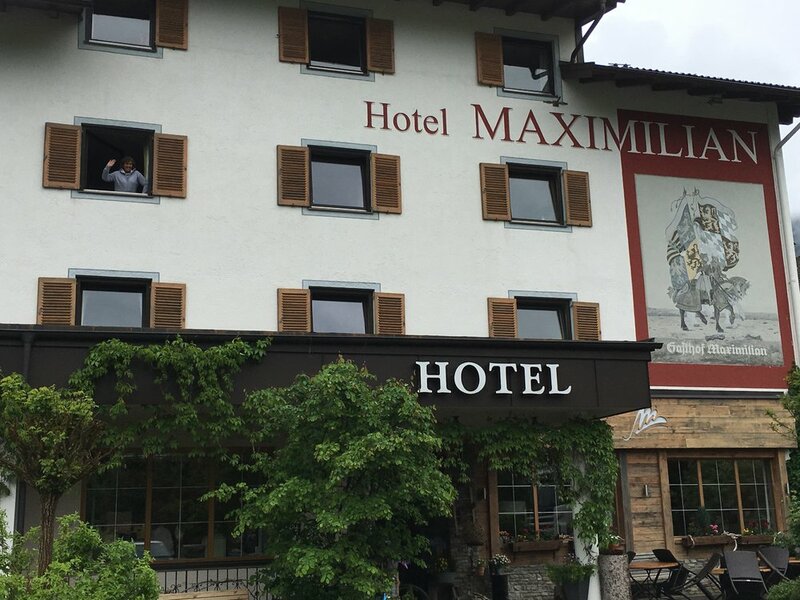 Now, everyone looking at our blog has seen something in this image of our hotel below. Do you see? A number of times, we've found ourselves near some Lilac bushes. These are next to the parking lot at our hotel, and they smell wonderful! These friendly cows across the road in front of our hotel are waiting for their owner to come back for them. This morning, about 20 minutes before we were to board the bus to leave to see the castle, I was looking out the front window (which opens completely out of the way to the side), and I saw almost a dozen cows walking through the hotel parking lot and across the road. There was a man driving them into the field on the other side of the road. But at first, I didn't see the man, only the cows meandering through the parking lot! They have now since congregated some seven hours after they entered this field, at the very gate where they came in. I can only expect that they are ready to go home for the evening.